During a visit to the Shivaji Museum in Mumbai, I captured this outdoor installation on the grounds of the Museum by Prashant Keluskar and Laxmi Narwekar. Very creative. The artists are trying to remind us that the earth is fragile. I think it better depicts the fragile and infantile nature of the human psyche. Perhaps you see both here. I have included a few more shots as well as a grab of the artists’ explanation below. What does this tell you? I commend artists who provoke thought and solicit change through their work. More art such as this should be in our public spaces to make us think about our absurd behaviour as humans! I like and appreciate the message the artist is trying to convey however it can also be interpreted as the opposite. 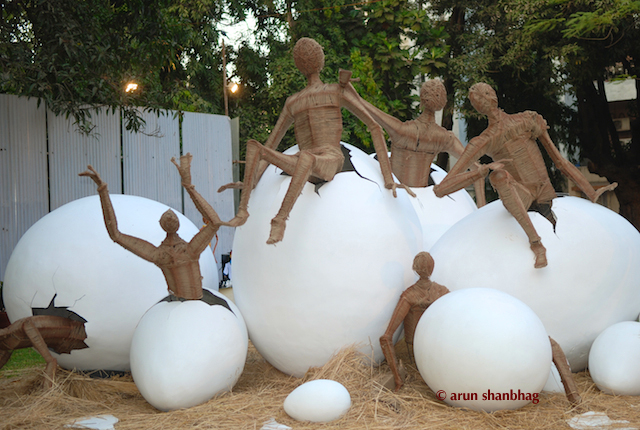 With the humans sitting on top of the eggs with their arms in the air suggests a certain level of dominance over the Earth–almost as if we as humans are trying to defy nature and are arrogant (or even ignorant) about it and carry on without much notice the Earth is in fact deteriorating. Just another perspective! WoW Preena, Interesting, and thank you for sharing that. We certainly need more independent art – independent as in that which does not necessarily conform to the reigning political, cultural norms. So these artists were indeed using art to nudge us into thinking. Nice exhibit -thanks for sharing the pictures. This reminds me of Decordova sculpture park near Boston. In 2005 I was lucky to see the temp 3D (indoor) art exhibit by Sally Moore that was mindblowing. Not sure what exhibits are on now but its a fun day out. In the ~14 yrs here, I have never gone to the DeCordova, even though I drive by it regularly. Now I only go to places which have face-painting (not the native american kind), ring toss, puzzles (48 pieces or less) and nearby toilets. Visit us and we will drag the kids. Hope you are enjoying the Cherry Blossoms.